'Stronghold', originally the James Coleman Drayton estate built c. 1886 and later the John Fairfield Dryden estate altered by George B. Post c. 1899 in Bernardsville, New Jersey. Dryden was president of the Prudential Insurance Company and U.S. Senator from New Jersey from 1902-1907. 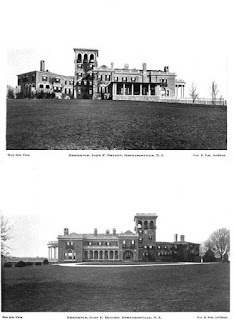 In 1903 Dryden purchased the George Post estate which abutted his property. 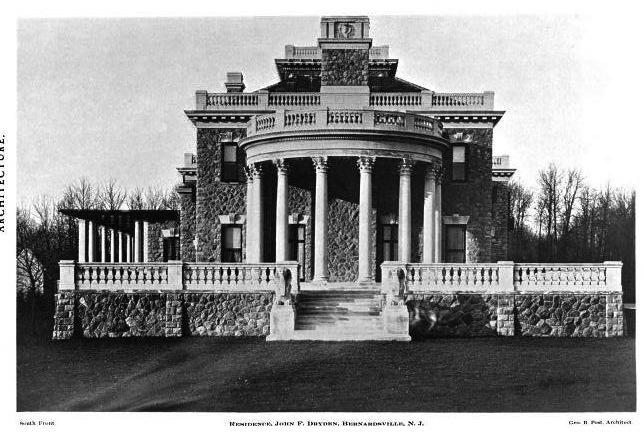 Following his death in 1911 the estate was owned by his son Forrest F. Dryden. From 1940-1996 'Stronghold' functioned as the Gill School but has since been returned to a private residence (as of 2005 it was owned by fashion designer Marc Ecko). Click HERE to see 'Stronghold' on google earth and HERE on bing. Interesting. Without the dates, I would have sworn that this was a remodeling of a Downing-esque Italiante villa of the 1850's or '60s rather than 1886. The Bing views give different views of the new construction and deconstruction with every twist--sometimes with completed new pool and terrace from the south view, sometimes with pool and terrace under construction. Call me crazy, but I think I'd have made the pool line up with the long porch, not the service wing, to keep everything in proper balance. But hell, what do I know? And while we're at it, let's play an installment of 'Six Degrees of Brooke Astor'. James Coleman Drayton was married to Charlotte Astor, sister of John Jacob IV and aunt of Vincent Astor. (The Draytons divorced the year after they sold the house to James Dryden. In turn, James Dryden's grandson, Dryden Kuser, married Roberta Brooke Russell who was later the third wife of her third husband, Vincent Astor. I like the south facade... elsewhere it is an unmitigated montrosity. A great building for a school. A residence? Uhhh.....I'll pass. What a confused and utterly gorgeous design amalgamation. So surprising. Would love to see if the interiors survived too. What were the odds that this could ever revert back from institutional use to a single family residence again? and what drew them to Nowheresville in the first place. if i had money enough to build this place, i think i would have picked a more picturesque location oh say Newark. also, that industrial building (probably the gym) certainly gives this house that certain nothing. at least its not surrounded by shacks like so many Long Island survivors. Bernardsville was the home to many of the turn of the century industrialists,architects,lawyers and bankers. Clarke, Blair, Frelinghuysen, Pyne, Stevens, Post, Dryen, Vallentine,and Mitchell were only a few of the families enamored by the majestic countryside provided to them on Bernardsville Mountain. I went to school here a long time ago. The interiors were intact until the school was sold. It was both frightening and awesome. There were so many nooks and crannies to explore and artifacts all over the place. It wasn't "surrounded by shacks. It was surrounded by other gilded age houses and there was seemingly limitless acreage. I was privileged to have essentially grown up there. As I also lived in a nearby "relic" of the Guilded Age, a home built for Haley Fiske on Mountaintop Road, I can attest to the incredible beauty these gentle mountains possessed. Of course the privileged gentry of the time would choose to have country homes near New York financial's district.I attended the Gill School in the 1950's which was at the Home Stronghold. It was a strange and bewildering experience. The art classes were held in a barn down the hill from the main building. Other classes were held in remodeled stable quarters or servant's quarters. The large porch to the left of the home was glassed in and was called the solarium. The home I lived in for a while was named Overcross and built by G.Post also.It had a very interesting history in itself, I loved exploring the 26 acres that remained in tact even then.